This Vegan Caesar Salad is perfect for a crowd-pleasing dish! 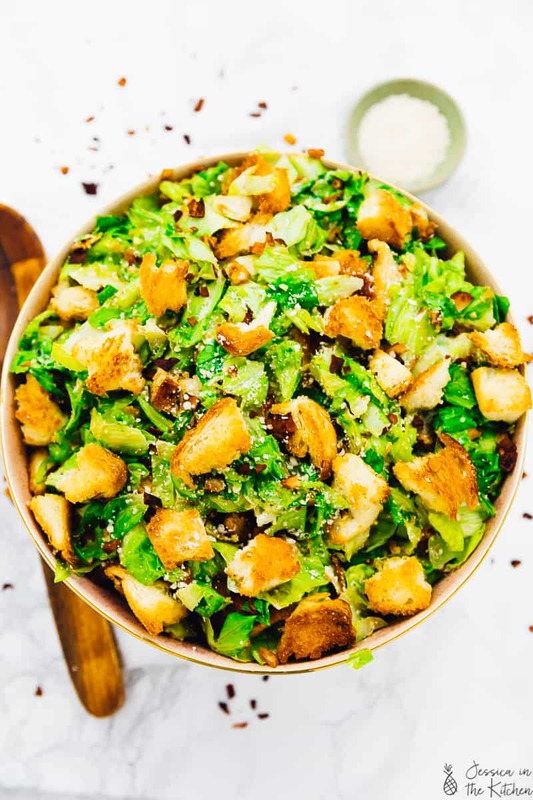 It’s made with a tangy creamy dressing that’s the perfect vegan re-make of the classic, crunchy croutons and crisp romaine lettuce! It’s bound to be a new favourite in your household. This post is sponsored by Thrive Algae Oil. All text and opinions are 100% mine. Thanks so much for supporting brands that support Jessica in the Kitchen! For someone who loved Italian food so much as a kid (it was my favourite cuisine), I haven’t had that many Caesar salads. Fortunately I’ve changed that now. After testing this Caesar Salad and the Vegan Caesar Salad Dressing out for a while, I’m so happy to finally be sharing it with you. If you ever had a really well done Caesar Salad before and you’re now searching for a vegan version, you’ve found your match. Not only are we re-making the classic vegan, we’re adding vegan coconut bacon bits to it. Friends, it’s about to get really delicious. Every time I make a vegan version of a classic, I aim to make it as close as possible to the original flavour wise. A traditional Caesar salad has anchovies in the dressing as well as egg yolk. These ingredients are for that salty flavour, as well as thickness. Naturally we aren’t having those here. To replace them, I opted to use capers instead of anchovies for that beautiful brine, and cashews for thickness. All the other ingredients here give it that tangy, divine Caesar salad dressing that we all know and love. It’s the kind of dressing that you want to drizzle on every single salad. Or like, everything that’s also on your plate with the salad. Up to you now, no judgment here. Speaking of the dressing, my oil of choice for this vegan caesar salad dressing is Thrive Algae Oil. You guys know that I love Thrive Algae Oil. 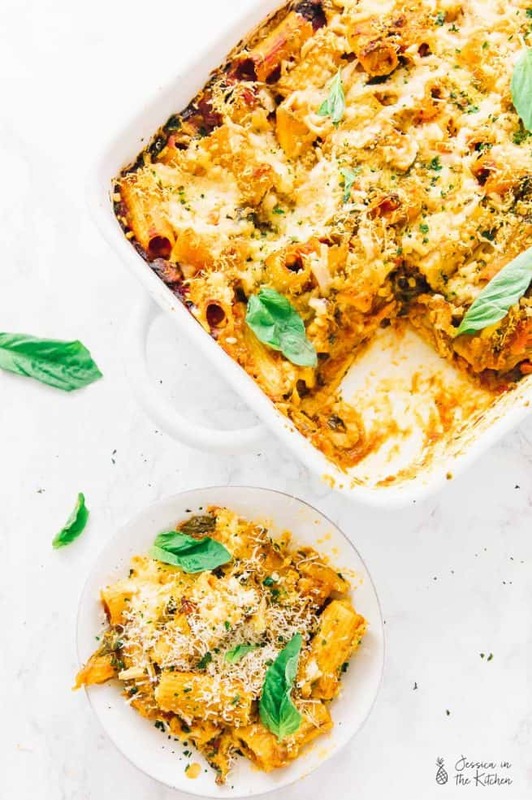 I used it quite a few times last year (hi there Vegan Pasta Bake, I am staring at you). I also saw that so many of you not only already loved it, those who didn’t know gave it a try! If you’re not familiar, let me count (write?) the ways that I love Thrive Algae Oil. Made with algae that was originally sourced from the sap of a Chestnut tree (not from water like other algae! ), Thrive contains the highest percentage of monounsaturated fats (MUFAs) (AKA the good stuff like in avocado!) of all cooking oils. That makes it known as one of the best oils for heart health. 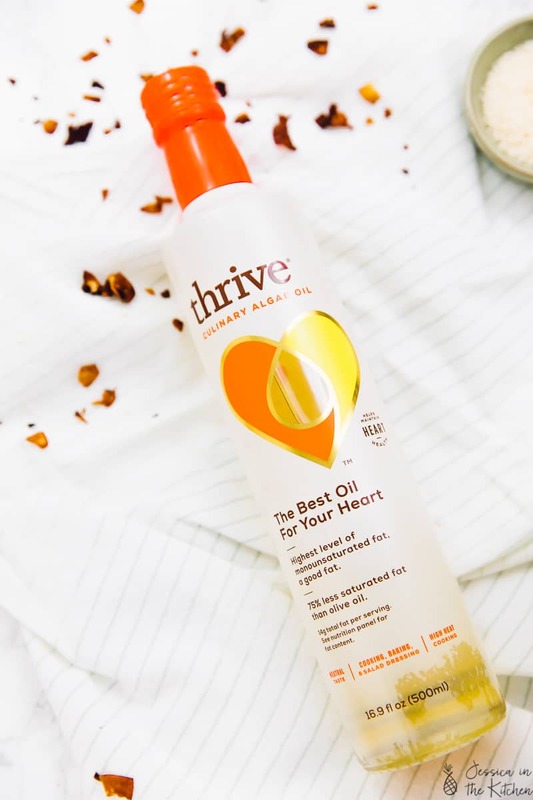 Even on their Amazon page, you’ll see so many people falling in love and agreeing that it’s one of the best oils they’ve used for all kinds of cooking and mixing. Another reason that I used it here is because I wanted the tanginess of the dressing to stand out, and to not have anything competing with that. 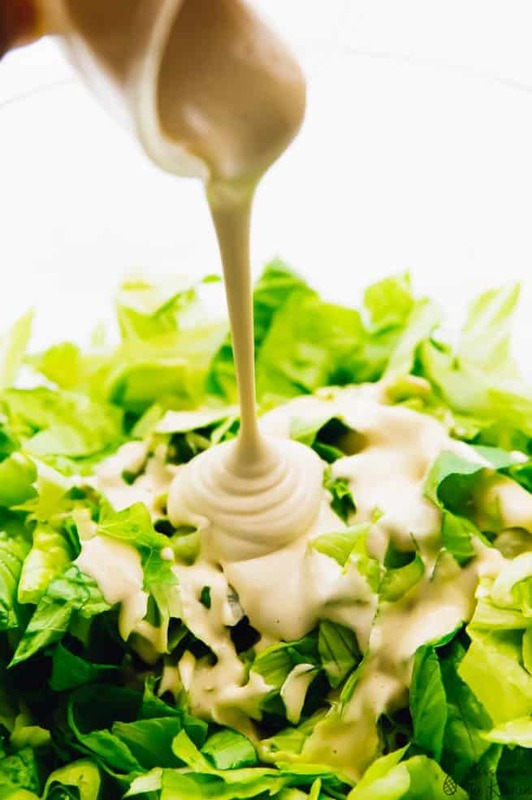 I love Thrive’s neutral flavour, so that the dressing flavours really get to shine through. I also get the benefit of its light creaminess and emulsification in the dressing, as well as the heart healthiness from the fats. It’s a win-win. P.S. – You can find Thrive in many grocery stores and on Amazon. 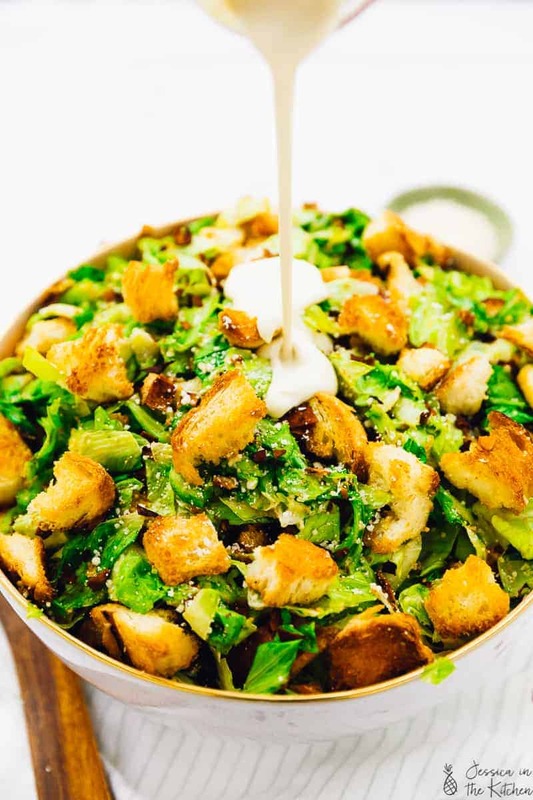 One of the things that I love about Caesar Salads are – you guessed it – those croutons. Crunchy, salty and baked with a little bit of oil to help it get crisp and flavourful. 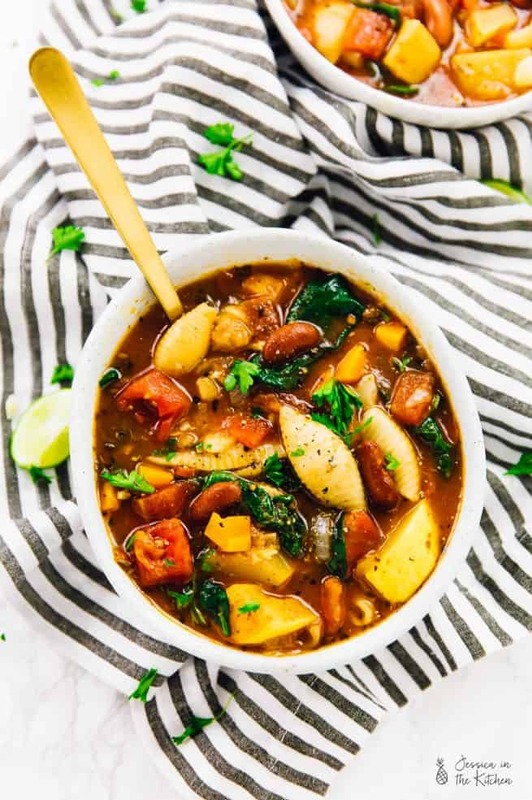 I decided to keep those in, but know that you could also swap them for chickpeas if you wanted to add some extra protein into this dish. Then I drizzled a little bit of Thrive Algae Oil on the croutons because it has such a high smoke point (up to 485°F), so I know I don’t need to worry about it doing anything other than helping those addictive little croutons get even crispier. I also wanted to keep things smoky and interesting so I added in coconut bacon. As you guys know, I love my coconut bacon and the flavour that it adds. It makes for the perfect addition to this salad and adds another layer of depth of flavour. I also love that the same flavours can be applied to other ingredients if you want to switch it up. You can try rice paper instead, or even crumble pressed tofu and soak it in the sauce. The options are endless! You’ll find that coconut bacon however is the easiest option. It’s also the option that lasts the longest since you can keep it in your freezer. Lastly, and certainly not least, vegan parmesan cheese. Good grief. I’m happy to report that vegan parmesan cheese adds another layer of beautiful brine and tanginess to this salad. I have a recipe that you can whip up, or you can buy your own – either in block form or sprinkle form. Feel free to make this salad your own and to your own taste. You can use as much or as little dressing on the salad as you want. You can add more coconut bacon or less vegan parmesan (let’s be real – you’ll never add less vegan parmesan cheese!). Okay, the slightly tricky part. Because this is a dressed salad, it tastes best fresh. If you have leftovers, you’re going to want to store it in an airtight container in your fridge for about 3 days. If you want to meal prep it, I highly recommend making the lettuce separate, the dressing separate, and the croutons fresh. Then you can assemble a small portion for yourself when you need it. That way it’ll last the longest in your fridge, up to a week for the dressing. I hope you guys love and try this recipe and check out Thrive Algae Oil! Enjoy, friends! Preheat oven to 400° F/200° C. Add the bread cubes to a silicone mat on a baking sheet or a baking sheet prepared with parchment paper or foil. Drizzle the Thrive Algae Oil over the cubes, and sprinkle with salt and pepper. Toss gently with hands to coat. Bake for 5 minutes. Remove from oven and set aside to cool. While the croutons are baking, you can make the dressing. Add all of the caesar dressing ingredients into a blender until combined and creamy. This takes about 2 minutes to ensure the cashews are throughly blended down. Blend until smooth, stopping to scrape down the sides of the blender if necessary. In a large mixing bowl, add the chopped lettuce. Drizzle a good amount of dressing (as much or as little as you’d like) over the lettuce and toss to combine. Add in toasted bread, coconut bacon and the vegan parmesan cheese. Toss until combined. 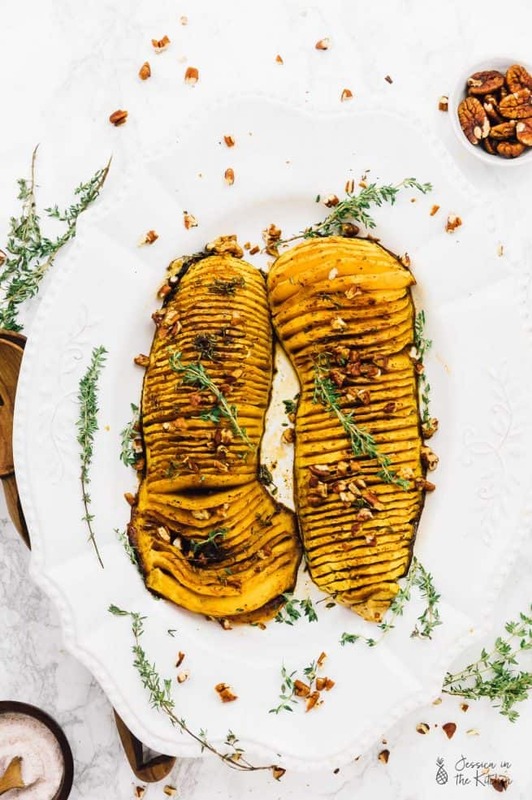 Serve with extra coconut bacon and vegan parmesan and dressing on the side. Enjoy! I don’t have thrive algae oil. Is there a oil you recommend besides that that would work best in the dressing? Hi Danielle! 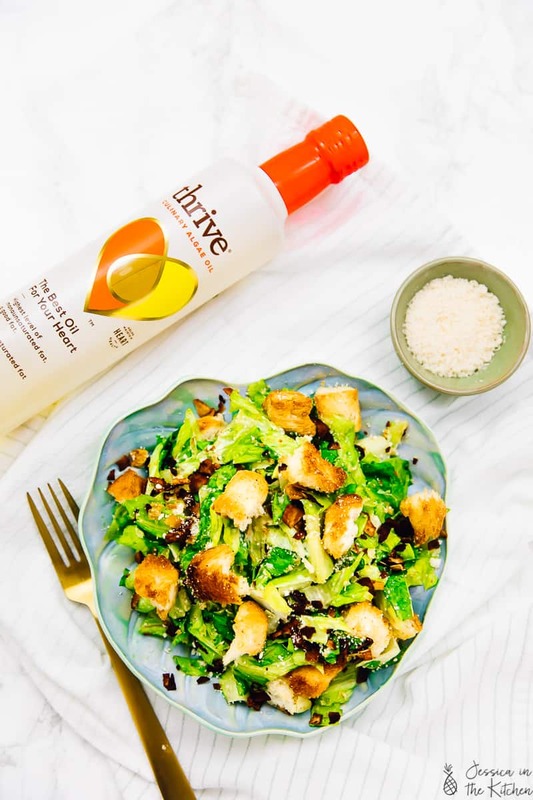 We used Thrive Algae Oil in this recipe because it fit so well with its high smoke point when baking the croutons and its neutral flavour when adding it to the dressing so we would highly recommend getting it on amazon https://amzn.to/2EWA42D . That being said, you could substitute the oil with olive oil instead! I hope that helps!